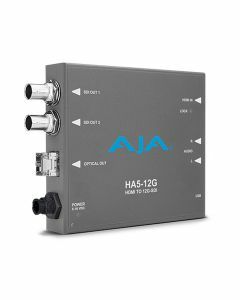 HA5-12G-T is AJA’s HDMI 2.0 to 12G-SDI Mini-Converter with an included Fiber LC single channel transmitter which extends 4K/UltraHD HDMI source signals over long distances (10 km Single Mode). The HDMI input is converted to 2x 12G-SDI Single link coaxial and a 1x Fiber LC outputs for driving 12G-SDI monitoring solutions, routing and more. Up to eight channels of HDMI audio or two channels of analog audio may be embedded into the SDI & Fiber output signals when selected.